Girls love having and collecting an array of beauty products, makeup and accessories. Sometimes, lining them up on the bathroom counter or cabinet isn’t an option for many reasons. There’s just too much stuff to fit there, it isn’t handy when getting ready in the morning and it just isn’t pretty enough. Girls need to be able to look at and easily reach for their beauty essentials in the morning, because otherwise there is a real chance that they might forget about this product or that after a while, no matter how lovely it is. 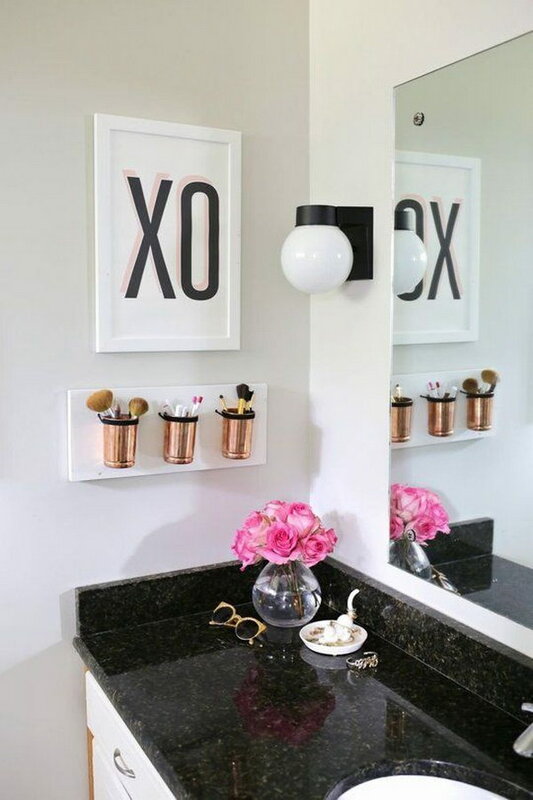 In this gallery you will find creative and awesome ways to store your beauty and makeup products, display your gorgeous perfumes and much more. Get ready to be inspired! Cake stands are a great way to display just about anything, so long as they are big and sturdy enough for the items. This black, ornamental one looks perfect as a perfume display, as it holds them while allowing you to easily see and reach for each bottle. via peekandponder. Glass jar brush holders are a classic that has yet to be replaced or go out of style. These metallic ones look just like something you’d get from a high-end store but are much more affordable and customizable. via youtube. This brush holder made from a sushi or place mat is definitely something you will not just find anywhere. It looks really cool on your vanity and keeps your brushes protected whether you leave them at home or carry them around with you. via irinascutebox. 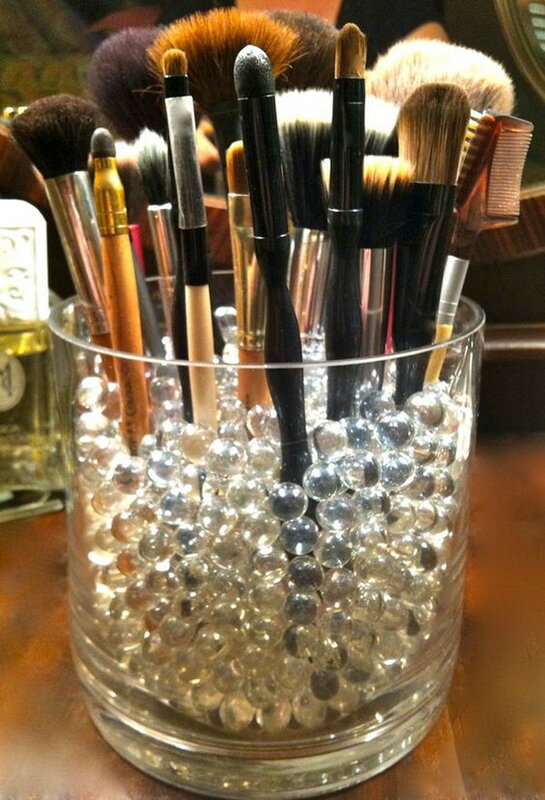 This makeup brush holder is even easier to make than the one we saw before, as all you need to do is fill a clean glass jar or bowl with pebbles, beads or anything else that will provide a decorative base and help hold your brushes upright for storage. via voguehome. 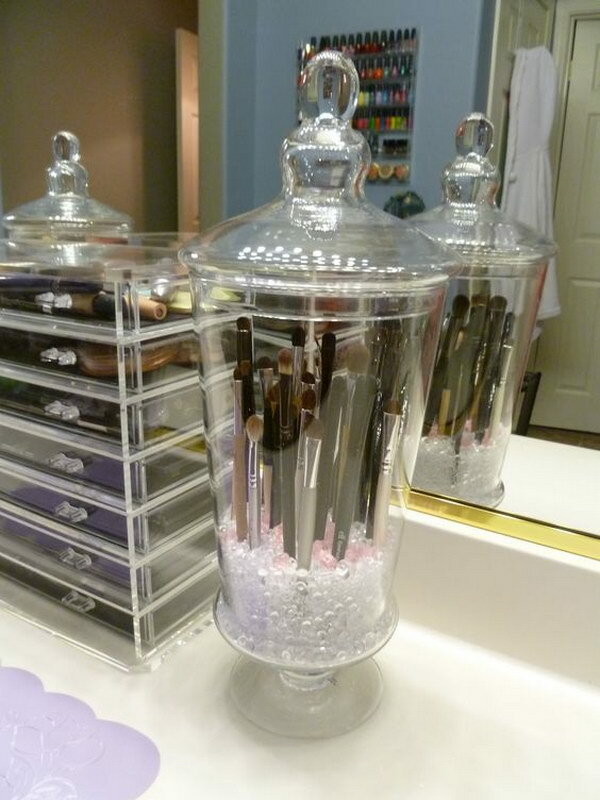 Acrylic makeup organizers are just about everyone’s favorite way to store makeup nowadays. The advantages are many: they contain and separate your makeup, are easy to clean and let you see inside so you know where every product is. 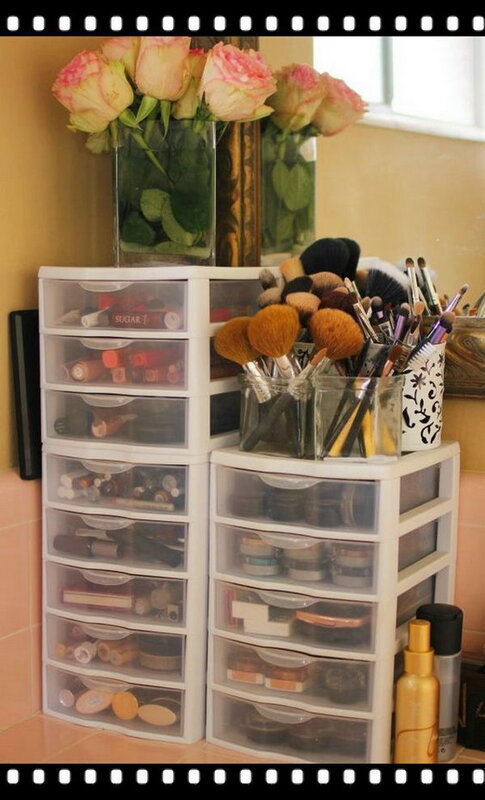 If you can’t buy acrylic storage though, you can get a similar effect by using plastic boxes or containers. source. Makeup palettes are very convenient to store your powder products in, but some of them can be quite expensive for what they actually are. 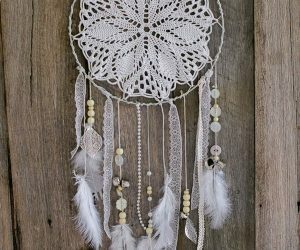 You can make your own using cardboard, crafts paper and a magnetic sheet, all of which will be a lot cheaper than a ready-made one. It takes more effort and outsourcing, but you can make as many palettes as you want and all of them will be completely unique. via prettylittledetails. The sharpie jars look super cute in their simplicity, but they will require you to challenge your artistic talents and skill. 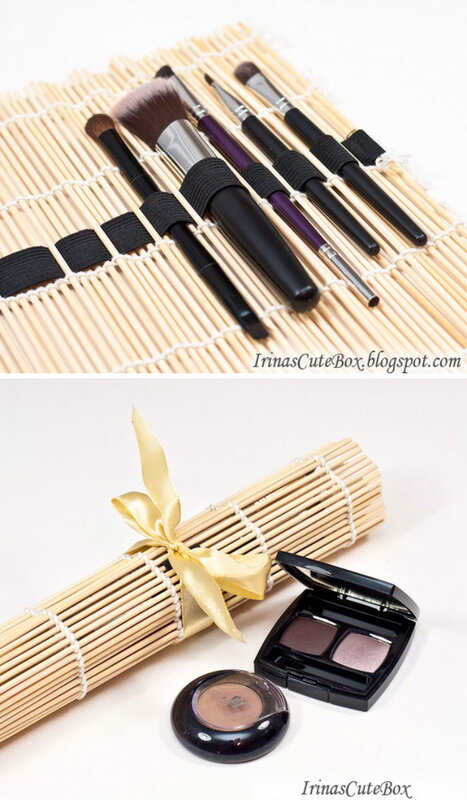 You can use them to store everything from brushes, to eyeliners and even some lip products. 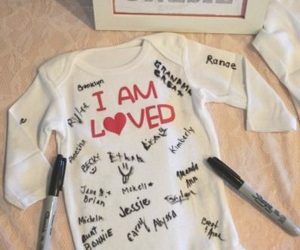 You can also make a slightly different project using colorful sharpies or even a stencil to make the drawing process easier. via lingyeungb. It is no breaking news that IKEA has some great makeup storage units. The cart is something you can see in salons and makeup counters, as products are easily accessible and you can bring them over to you instead of having to get ready in a specific place. 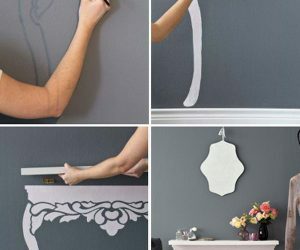 You can pretty it up by spray painting it and adding some decorative labels. via polkadotchair. 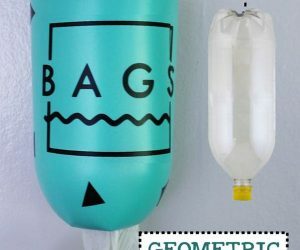 This is another easy and affordable recycling project which is perfect for people who drink a lot of sodas. It works best if you have bottles of different colors, as you can store different things – brushes, pencils, sponges – and separate each category by color to create a color-coded, rainbow makeup display, but you can also opt for just one color for a more cohesive, elegant look. via pluii. 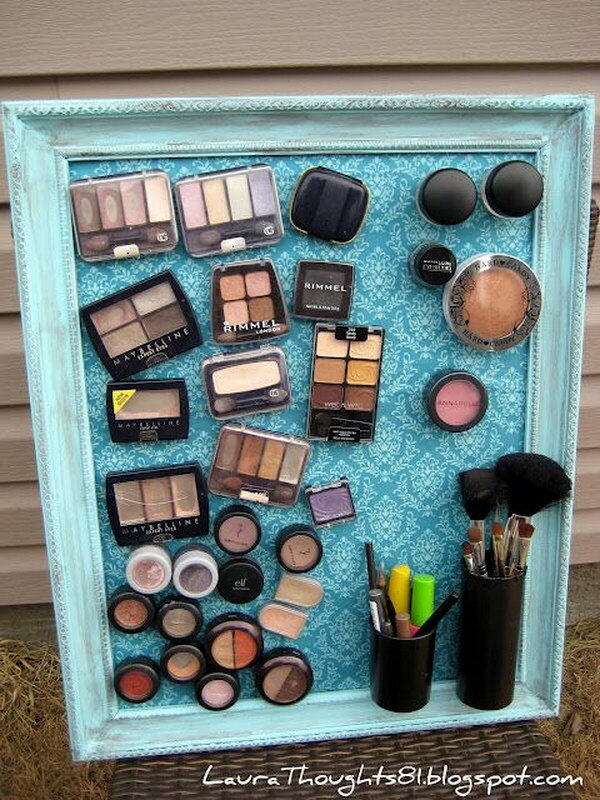 This is an interesting, yet perhaps a little risky way to display makeup. Like a magnetic makeup palette, you can easily secure your makeup products to this board using their metallic pans and a magnetic sheet. All you need to do when you want to use a product is reach into your artistic display. Make sure your magnetic sheet is strong though, because makeup products are notorious for breaking easily when they fall. via laurathoughts81. This hanger organizer is definitely a clever and unique way to store makeup products and tools. It looks really cool, it’s easily accessible and it also has the added benefit of transparent pockets which let you see their contents. Via amazon. Candle jars are usually great, heavy-duty glass containers that can and should be easily repurposed. All you need to do is burn your candle down, wipe it all clean and then use it to store your makeup or tools. You can add colorful pebbles or sand at the bottom for decoration and to hold your stuff or pack it all tight in there if there’s a lot to store in the jar. via lifeannstyle. 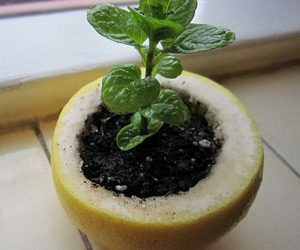 This DIY is quite simple. 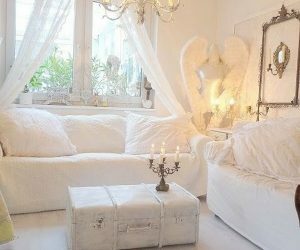 All you need are glass jars with lids – a lot candle jars are like that – and decorative figures made of ceramic or another similar material. 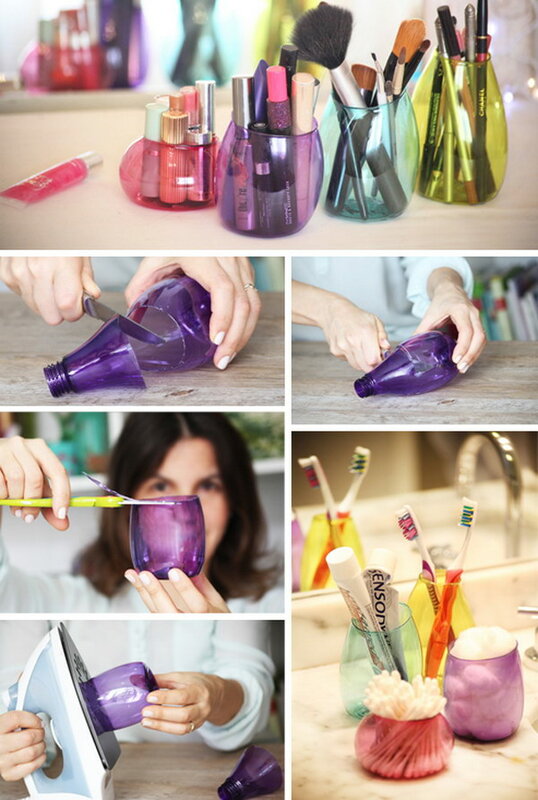 Glue them to the lids of the cleaned jars and you have a cool and pretty way to store makeup and beauty tools. via lifeannstyle. This Mason jar wall organizer is for truly crafty girls – or you can ask your boyfriend to build it for you. 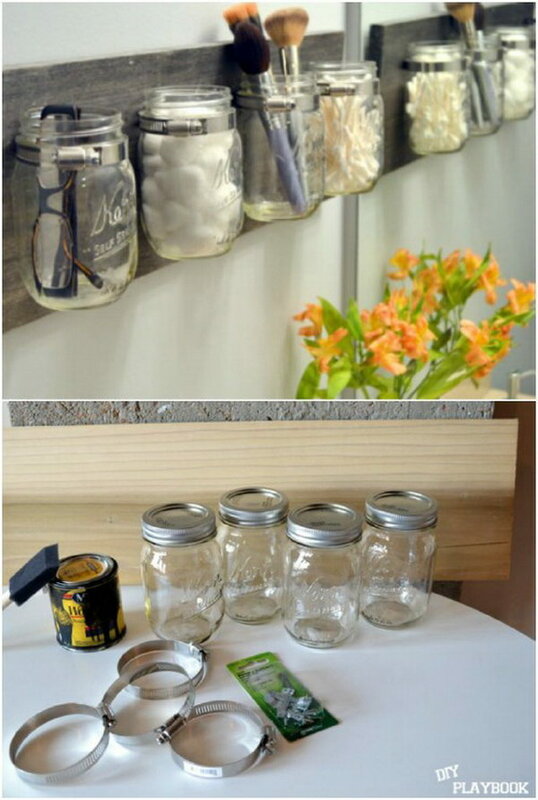 The idea is to attach the mason jars lined up against a wooden plank on the wall so as to make a rack of jars where you can put your makeup and tools for display and easy access. via thediyplaybook. 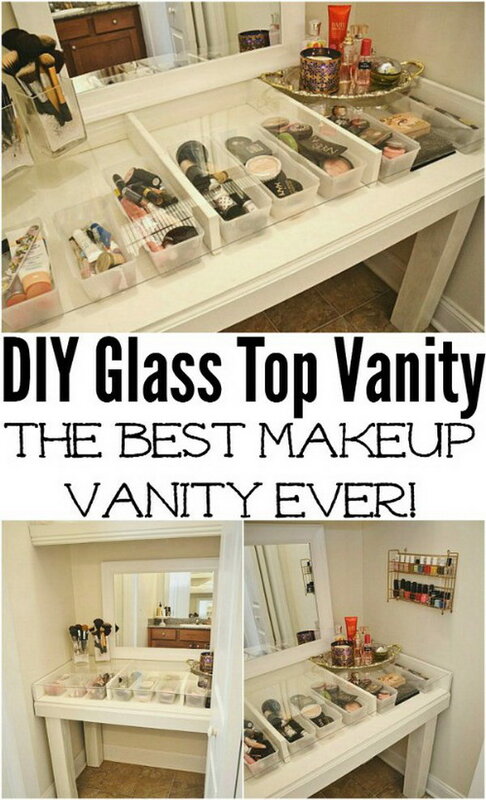 This vanity is a really cool, as you can see all of your items through the Plexiglas top. via lizmarieblog. Glass cups, jars and vases always work great and look beautiful as brush holders. 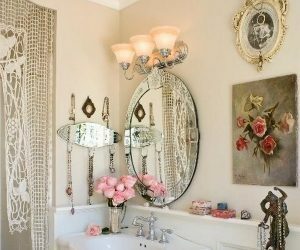 Glam them up by simply adding clear iridescent beads / marbles. This white wall nail polish rack is a great way to store and display your nail polish collection, so you can look at your array of colors and choose the one which suits your mood when it comes to painting your nails. It takes work and skill to build though, so you might need to enlist some help to put it together. via hellbentforlipstick. It’s clever to Storage your nail polish in a clear glass container, so you can see each polish without having to do tons of digging. 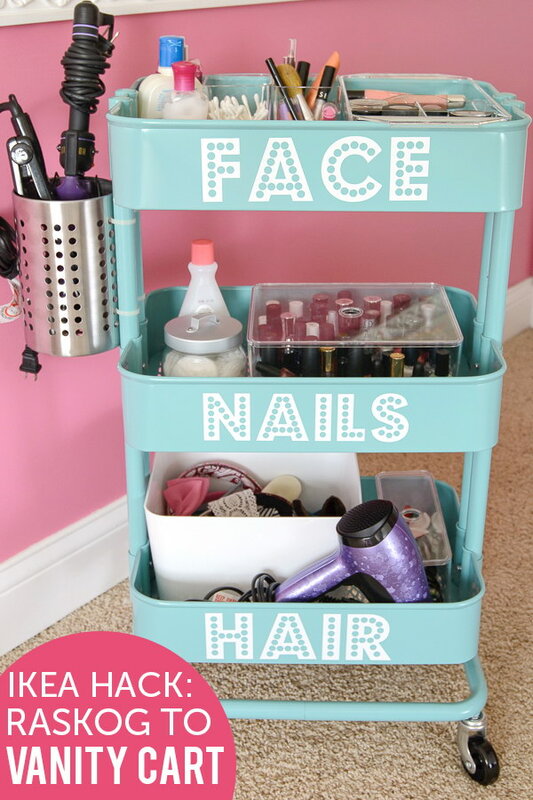 It works really nicely to store a relatively small nail polish collection. Via dailymakeover. This is another useful storage project you can easily make using cardboard. You can start by building your own box or using an old one. Then all you need to do is create dividers to hold your lipsticks using repurposed cardboard scraps and decorate them using paper, markers or paints to make the box look nicer. via emilydenisephotography. These spice racks work really nicely as nail polish storage as you can hang them on the wall and easily have your bottles organized and displayed. 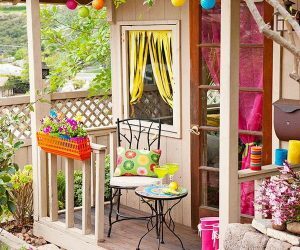 You can use them as they come for a rustic touch or paint them a pretty, vibrant color to make them more fun and feminine like in the picture. Via flickr. 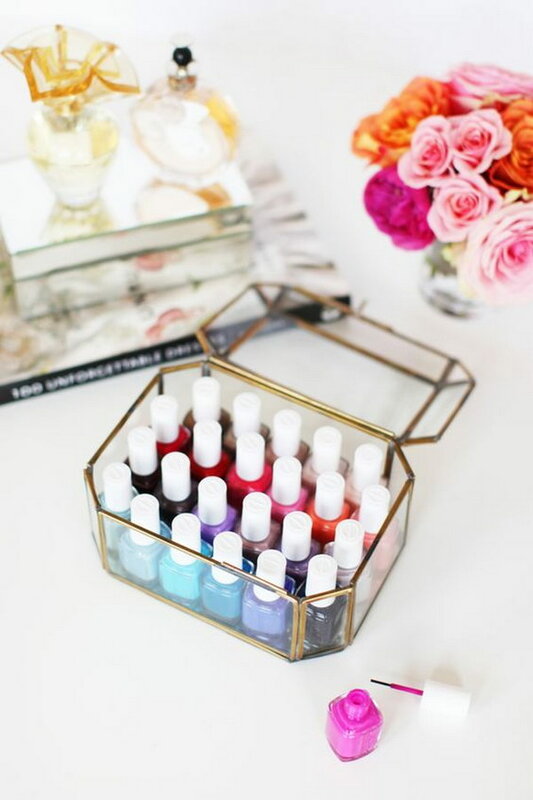 This rack was probably not meant for nail polishes, but it became a really pretty way to store and display them, as the bright colors contrast beautifully with the wood. 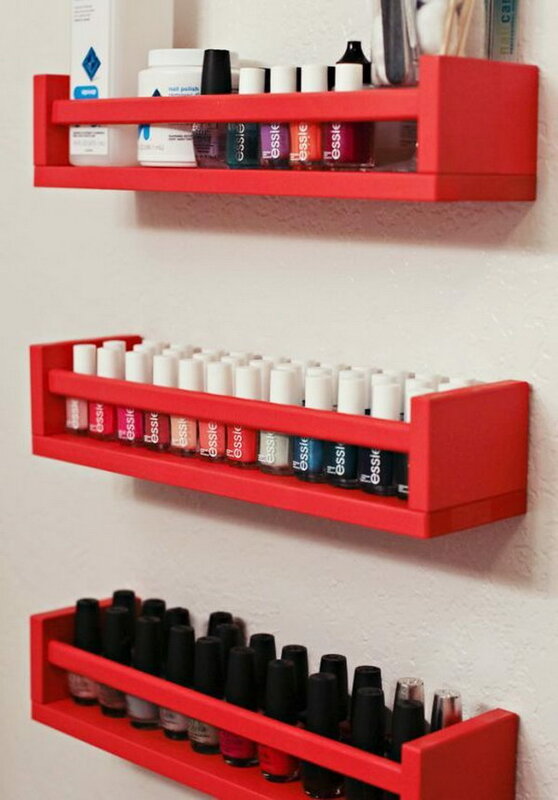 If you can have hanging bookshelves, why couldn’t you have hanging nail polish shelves? This project shows that you actually can. You can make the shelf from scratch like was the case with this floral monochrome number, or you can buy a ready-made one and decorate to your taste before adding your bottles to it. via soyouthinkyourecrafty. 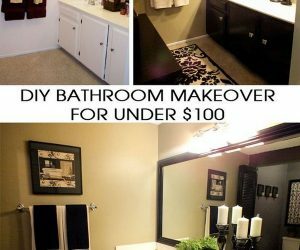 Your vanity has big, long drawers but no dividers? This project is great for you. 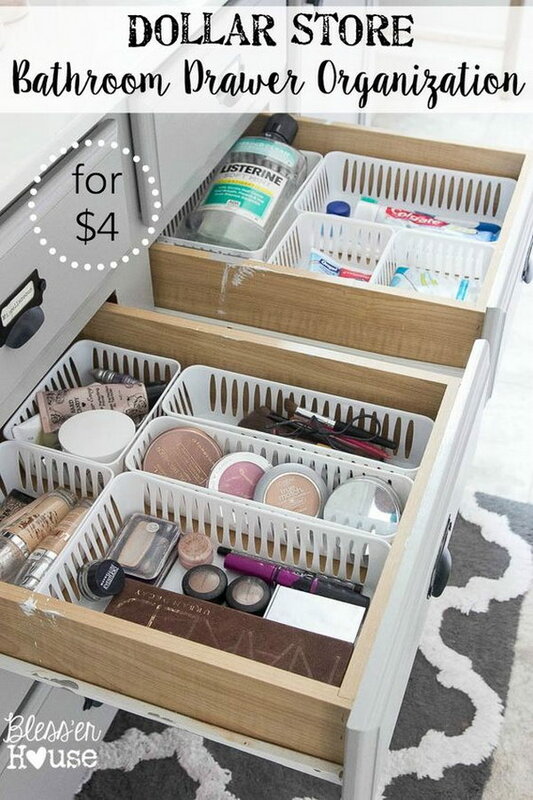 All you need to do is find some affordable shallow baskets that fit your drawers and place them inside to divide your products into categories and make sure they are not rolling around. via thesummeryumbrella. This project is similar to your Mason jar wall organizer. You need a wall structure with holders – or you can make your own – and some metallic jars to place things in. Add the jars with your tools inside to the holders and your project is complete. Via abeautifulmess. These plastic towers are probably meant for documents or office supplies, but they are a great, more affordable alternative to acrylic storage. They are really cool because they organize your makeup while leaving it visible and they usually come in different colors you can choose from. This DIY looks really sophisticated, but it’s not very complicated. 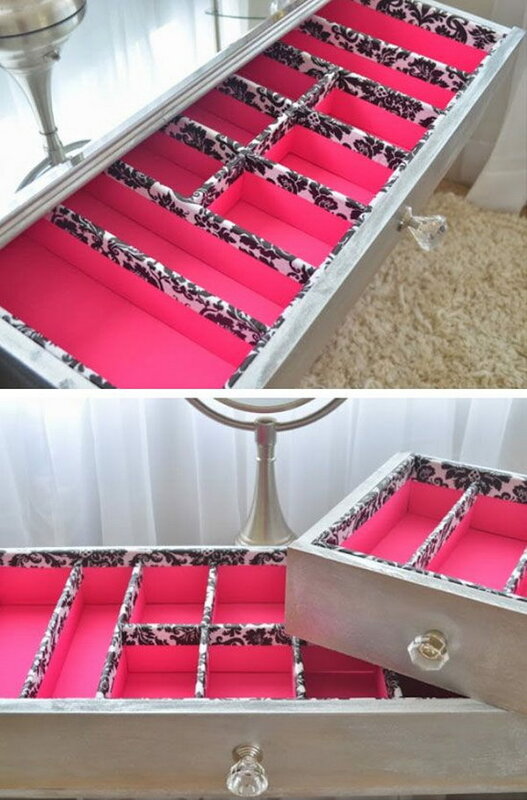 To make these drawer dividers, which help separate and organize your makeup, you will only need thick cardstock and two fabrics for lining and trimming the space. Aside from looking pretty, the fabric also adds a professional touch and helps hide imperfections, which is an added bonus. via youtube. 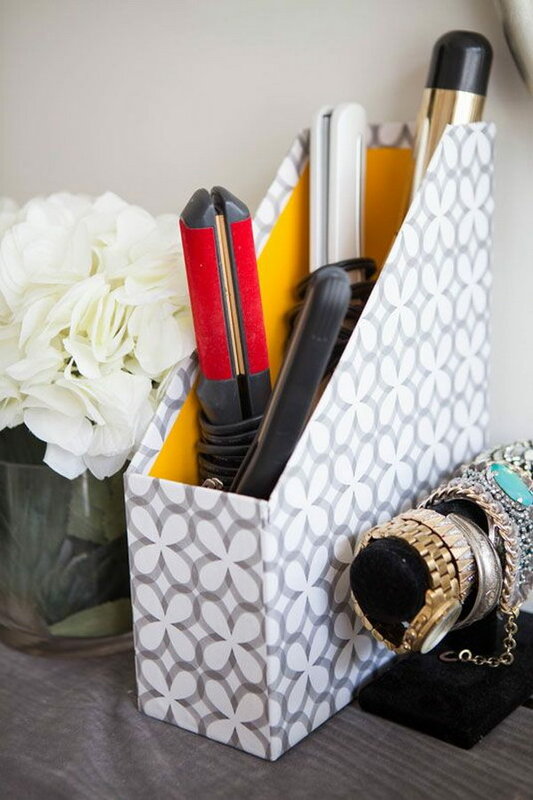 Organizing hair tools isn’t easy, but using magazine holders is a great idea, as they’re usually decorative and affordable and they’ll help keep products upright and cables contained. 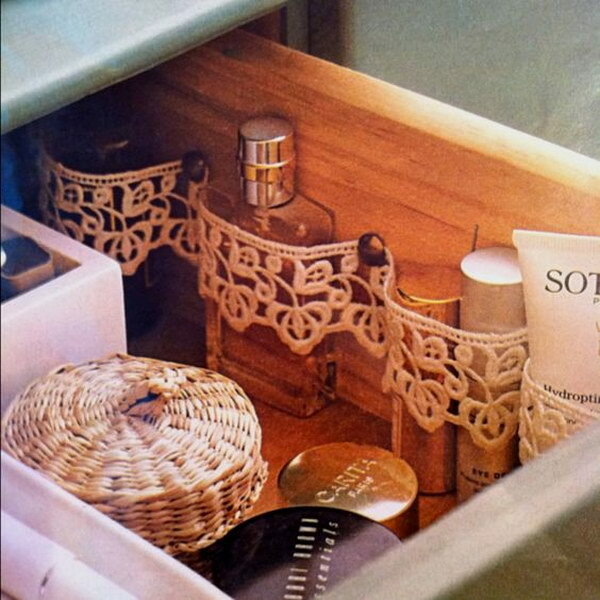 These lace partitions are a great, dainty way to make drawer dividers without taking up a lot of space from your products. Lidded jars are a great way to keep products and brushes from catching as well as spreading dust. These decorative ones are perfect because they are beautiful and tall which is very important in order not to misshape the brushes. via itsagandechlife. A toothbrush holder is great for organizing brushes because it keeps them upright and separate. You need one that has relatively wide holes though, as makeup brushes usually have wider handles than toothbrushes. Via saecca. This toolbox storage is similar in layout to the trunk cases used by professional makeup artists. You can use each drawer for a different makeup or tool category and they’ll always be organized and accessible when you go get ready. It also has the advantage of folding in for saving space when not in use. See more instructions via theoriginalpinkbox. 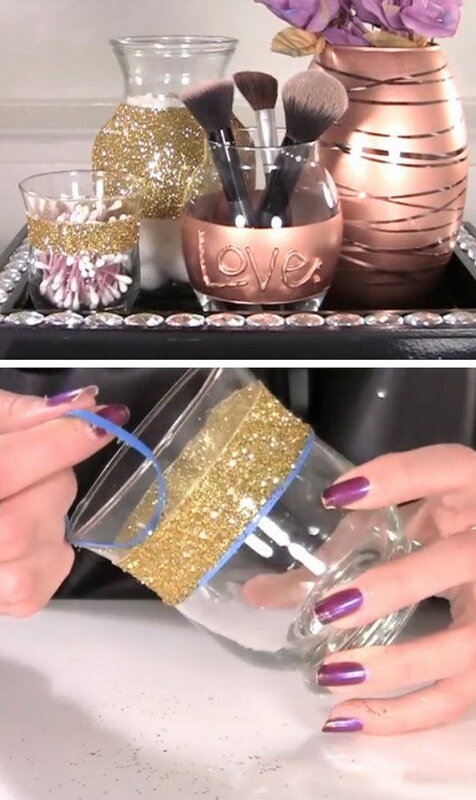 All you need to make these holders are empty glass jars, cute fillers and ribbon. Tie or glue your ribbon to the jar, add some beads to the bottom and it’s ready to hold your brushes. via prettyinpigment. Office supplies are great for holding palettes because they have similar dimensions to paper and folders. With these holders they are always organized, accessible and on display.